CLARK AND NASIR ARE OVER THE MOON WITH THE SPECIAL INTERVIEW OF FERNANDO ALONSO’S FORMER TEAM MATE… GIANCARLO FISICHELLA FROM THE DAYTONA 24 HOURS RACE LAST WEEKEND. In 1996, he made the move to Formula One, making his debut for the Minardi team, after being the official test driver the previous season. However he did not complete the full season since Minardi required a driver who could bring funding to the team, and replaced Fisichella with Giovanni Lavaggi. For 1997 he made the move to Eddie Jordan’s eponymous team, where he drove alongside former F1 champion Michael Schumacher’s brother Ralf, himself a former Formula Nippon champion. Fisichella gained his first podium finish at the 1997 Canadian Grand Prix, and went on to finish higher in the points standings than his team-mate. At Hockenheim a victory looked to be within reach for Fisichella, but a puncture and the performance of an on-form Gerhard Berger denied him the win. Fisichella was able to show his talent again at the rain-soaked Belgian Grand Prix in which he finished a commendable second behind Michael Schumacher. Following this race, the Benetton team signed him for 1998. The timing of his move to Benetton move was unfortunate. Following Renault’s withdrawal from Formula One, Benetton would contest the 1998 season without “works” (factory-supplied) engines, instead using rebranded development versions of 1997 Renault engines. Despite not having the latest engines, Fisichella still managed second places at Montreal and Monaco, even being in contention for a victory in Canada until gearbox problems slowed him down. In Austria, Fisichella scored his first pole position, although an on-track clash with Jean Alesi during the race cost him any chance of a good result. He was then able to add only two more points to his total in the second half of the year as Benetton lost ground on their competition. 1999 proved to be a similarly inconsistent season for Giancarlo Fisichella. He did score some points finishes, including second at Montreal, and again came close to a victory in the European Grand Prix, until he spun off whilst in the lead. This would prove to be his best chance of a victory for the next few seasons. Fisichella’s season was to follow a similar pattern in 2000. He again gained some surprise podium finishes early in the year, but Benetton’s now unfortunately traditional poor second half of the season meant that he failed to score any more points. Since joining Benetton, Fisichella had comprehensively outperformed his Austrian team-mate Alexander Wurz, who would then leave the team to make way for British rookie Jenson Button in 2001. Renault had purchased the Benetton team by the start of the 2001 season, but their investment was too late to enable much progress with Benetton’s uncompetitive 2001 car, and as a result, Fisichella was battling for much of the season with teams such as Minardi and Prost. However, the efforts of technical director Mike Gascoyne and his staff did result in improvements over the year, culminating in a 4-5 finish at the German Grand Prix and a third-place finish for Fisichella at the Belgian race. Despite Fisichella gaining the team’s best results that season and consistently outperforming Button, he was not retained by the team, so he rejoined Jordan for 2002. Fisichella managed to score just seven points in 2002, comfortably outpacing new teammate Takuma Sato, although the Jordan-Honda car of that year was never truly competitive. After Honda withdrew their engine supply, Jordan switched to Ford engines for the 2003 season, but the team were still unable to compete with the top teams on the grid. Despite this lack of performance, Fisichella won his first race at the Brazilian Grand Prix. Battling with McLaren’s Kimi Räikkönen amidst heavy rain and numerous crashes, Fisichella took the race lead on lap 54, soon before the race was red-flagged. However, he was demoted to second place on the podium, because (per regulations) Räikkönen was the race leader two laps prior to the red flag. Several days later, though, the FIA determined that Fisichella had already begun his 56th lap before the red flag, meaning that he, and not Räikkönen, had been leading the race two laps before its premature end, awarding the Italian his first F1 victory. Fisichella was the only F1 driver to have won a race without having stood atop the podium. He collected the winner’s trophy at the next race at Imola. Fisichella’s only other points finish of 2003 was to be a seventh place at Indianapolis. Unhappy at the Jordan team’s performance, Fisichella moved to Sauber in 2004 in the hope of greater results, and of using the team as a way of gaining access to, and a drive for, 2003 World Champions Ferrari, who supplied re-badged engines to the Sauber team. Fisichella drove well all year, comfortably outpacing team mate Felipe Massa for much of the season (scoring 22 championship points vs Massa’s 12). Fisichella at the 2005 United States Grand Prix. His strong performances prompted former Benetton-Renault team boss Flavio Briatore to re-sign him for the 2005 season as partner to the young Spanish driver Fernando Alonso. A win at the season opening race at Melbourne signalled the Formula One breakthrough that commentators had been predicting, but it proved to be something of a false dawn. A run of poor luck saw Fisichella fall behind his team mate in the championship standings, and at times the pair were achieving noticeably different lap times with the same equipment. It appeared that Fisichella simply did not have the pace to match Alonso. The difference in pace between Fisichella and Alonso was noticeable, and while Alonso’s metronomic consistency helped him win the 2005 championship, Fisichella’s general bad luck was to cost him points finishes. He was overtaken and lost the lead on the final lap of the Japanese Grand Prix by McLaren driver Kimi Räikkönen, despite his race engineer urging him to avoid letting Räikkönen past. Nevertheless, his performances alongside Alonso throughout the season enabled Renault to win the World Constructors’ Championship ahead of McLaren and Ferrari, the team that had won that title the previous six seasons. Daytona International Speedway, Sunday 29 January 2017 – No. 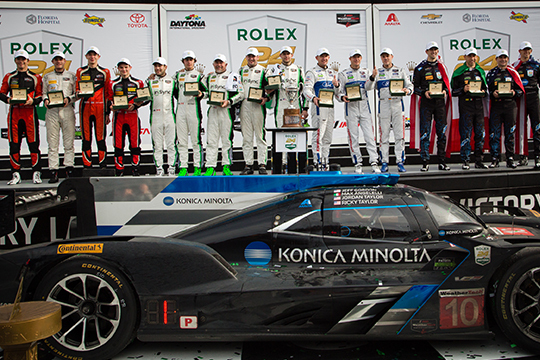 10 Konica Minolta Cadillac Dpi-V.R won the 55th edition of the Rolex 24 At DAYTONA this afternoon, completing 659 laps of the famous Daytona International Speedway. Ricky Taylor took the chequered flag first after a testing 24 hours ensuring that he and his team mates, Jordan Taylor, Max Angelelli and NASCAR legend, Jeff Gordon, were awarded the Rolex 24 At DAYTONA trophy and a specially engraved Rolex Oyster Perpetual Cosmograph Daytona. Captivating, spectacular and extremely demanding, the ‘Rolex 24’ is one of few motor sport events in the world to test the ultimate limits of man and machine, all against the clock. Hurley Haywood, five-time winner of the Rolex 24 At DAYTONA, waved the green flag at 14:30 local time on Saturday, officially marking the start of America’s famous race. The Cadillac Prototype trio of the #31 Whelen Engineering Racing, #10 and #5 Mustang Sampling Racing set the pace from the beginning before early favourite, #31, suffered steering issues in the eighth hour. As darkness fell the rain began to fall and a bitter cold set in, making the track treacherous and demanding the utmost concentration from the teams. In the early hours of Sunday morning with the extreme conditions refusing to let up, the field experienced two extended hour-long safety car periods, underlining the true attritional nature of this test of endurance. The cars competing this year are the most technologically advanced of this era; every lap is a learning experience for teams who are pushed to the limits. With three hours remaining, and finally a dry track, the Prototype (P) and GT Le Mans (GTLM) winners were far from decided with multiple cars on the lead lap. 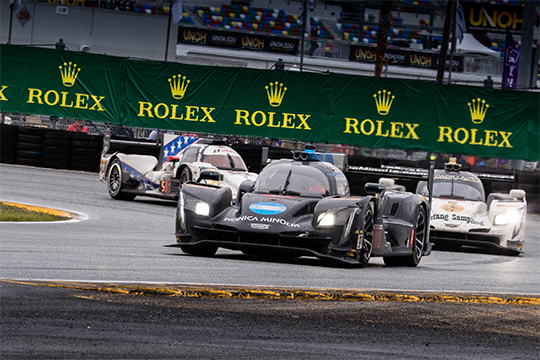 Counting down the final minutes on the Rolex clock, the race went down to the wire with a thrilling battle between the leading Cadillacs; ultimately the #10 took the lead from the #5 with a legal and robust move into turn 1 with only moments to go. Throughout the 24 hours the #10 successfully answered everything its rivals, nature and time could test it with and deservingly took the chequered flag by only 0.671 seconds from its sister car. #66 Ford Chip Ganassi Racing took victory in a very competitive GT Le Mans class having battled until the closing minutes of the race with the second place #911 Porsche GT Team holding off #62 Risi Competizione. #38 Performance Tech Motorsports won the Prototype Challenge (PC) title and #28 Alegra Motorsports the GT Daytona (GTD) class. Forty-one of the 55 race starters made it to the finish, further exemplifying the punishing nature of this two-lap test of the clock. The 3.56-mile circuit demands a unique combination of resilience, skill and awareness, as well as reliability and performance, proving there are two types of winners at the Rolex 24 At DAYTONA: those who win and those who cross the finish line after 24 hours. With much of Oruro and the surrounding area underwater this morning the Dakar Rally organisers had no choice but to cancel Stage Six. 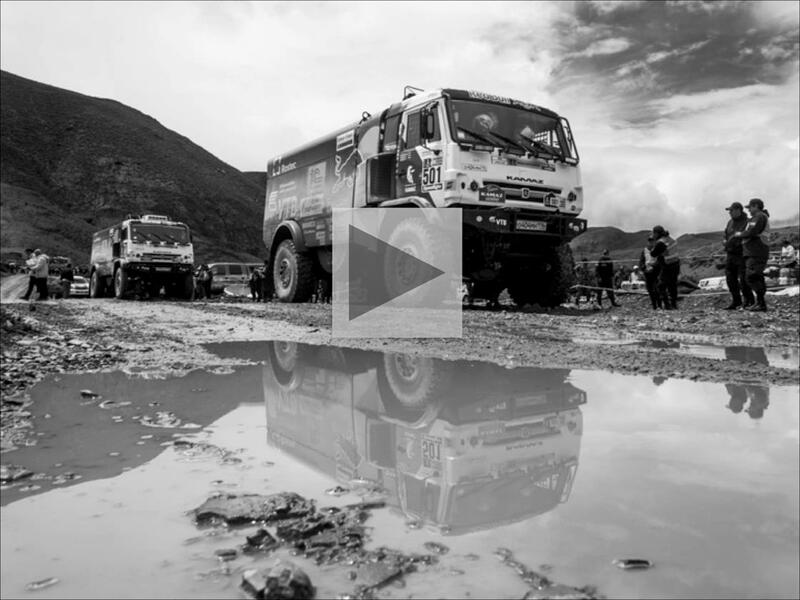 The “extreme climatic conditions” in the region saw competitor safety put first and the proposed 527-kilometre timed special stage between Oruro and La Paz called off. Get a real sense of the torrential rain falling in Oruro and the impact it had on proceedings by watching/downloading today’s News Cut here. Those competitors who remain in the race after a gruelling first week that has seen high-profile retirements, such as Nasser Al-Attiyah, Carlos Sainz and Toby Price, came into La Paz this afternoon. The racers were greeted by hoards of enthusiastic fans that lined the streets of the highest capital city on the planet. Now comes a well-earned Rest Day in La Paz with racers searching for a slice of comfort after exiting the mudbath of the Oruro bivouac. Rest Day gives Dakar competitors a chance for a full service of their race vehicle, various media commitments and hopefully the chance to get some much needed shuteye. The Rest Day also gives a chance for petrolheads such as windsurf legend Robby Naish to get an up close look at how the Dakar works. Naish is due in the La Paz bivouac on Sunday to catch up with crews such as Team Peugeot Total, the Red Bull KTM Factory Team and Team Kamaz Master. After a dramatic first week of action they’ll be no shortage of stories for the thrill-seeker to hear about. Enaam Ahmed, friend of F1 Weekly from his sensational karting career, is hoping to get his 2017 racing campaign rolling to match the conclusion of his 2016 season. The Tasman series may have flown into extinction like the Dodo bird, but the New Zealand-based Castrol Toyota Racing Series has feathered the careers of several promising young drivers over the past few years. Recent past champions include home grown talent Mitch Evans, who went on to become GP3 Champion. Lance Stroll won the championship in 2015 and this season will see action in Formula 1 with Williams. In 2016, Lando Norris took the title and went on to win the Formula Renault Euro cup. Enaam is now 16, the minimum age requirement to compete in the Castrol Toyota Racing Series, and with two race winning seasons of open wheel competition behind him, is looking forward to championship challenge against not only much older drivers, but also drivers who raced last year in the same series. The opening round of the 2017 Championship is on January 14 at Ruapuna near Christchurch. Each round features three races and is staged on successive weekends; the final event on February 12 at Manfeild is the prestigious New Zealand Grand Prix. After winning five karting championships in his final season of karting in 2014, Enaam raced to Rookie of the Year honors, and 5th overall, in the 2015 British MSA Formula Championship. He also raced in selected rounds of the Northern European-based SMP Formula 4 Series; winning five races, including all three at Pärnu in Estonia. The 2016 season saw Enaam step up to the BRDC British F3 and in the opening round at Snetterton he was a race winner and also finished on the podium in the other two races of the weekend. He was classified 5th in the overall standings in this very competitive series. He then completed the 2016 racing season on a high note by winning the British F3 Autumn Trophy. The car used in the Castrol Toyota Racing Series is the Italian Tatuus single-seater, powered by a 1.8 liter Toyota engine which produces around 160 kWs running on an 85 percent ethanol bio-fuel. Michelin is the official tire supplier. Enaam will race with Giles Motorsport; his teammates will be Australian Luis Leeds and Dutch driver Richard Verschoor. Quick and consistent, Enaam’s fighting spirit has been the hallmark of this young racer from London town. Racing so far from home base, Enaam said, “I’m really excited to be going into TRS with such fierce competition. It’s going to be a really good challenge to go up against these experienced guys as I wasn’t old enough to do it last year.